On 6th March there was a one-day hearing in the Supreme Court in London on the UK’s failure to meet legal limits for air quality. In parts of London the air pollution standards are regularly breached, putting the health of thousands of Londoners is at risk. It is not only in London that there are air pollution problems but in 16 UK regions. It is thought there are some 29,000 early deaths per year in the UK caused by air pollution, a higher number than those from obesity and alcohol combined. The UK government has not met the EU standards on nitrogen dioxide emissions and in London it is unlikely that clean air targets will be met until 2025, 15 years late. The environment charity, ClientEarth, argued in the Supreme Court that the national courts must enforce EU environment law in the UK. It is understood that the European Commission is encouraging the Supreme Court case because it would prefer to avoid a direct confrontation with the UK, which is objecting to other EU environmental rules. However, If the Supreme Court does not require action, the European Commission must. After the 6th March hearing, the court reserved judgement. However, Client Earth hopes this will be handed down before Easter. The Supreme Court has reserved judgement on the UK’s breaches of EU air pollution laws. The government admits air quality laws will be breached in 15 regions until 2020. Londoners will have to wait until 2025 for pollution to enter legal limits. Pollution levels in affected areas are a health risk to people on many of Britain’s busiest streets, especially those with heart or lung problems. The government says the laws are unrealistically strict. The BBC understands that it also believes the European Commission is partly to blame because it did not set proper limits on pollution from diesel exhausts in the first place. The High Court and later the Court of Appeal refused to take action on the issue, ruling that enforcement was a matter for the European Commission. An environment charity, ClientEarth, will now argue in the Supreme Court that the national courts must enforce EU environment law in the UK. About 29,000 early deaths each year in the UK are blamed on air pollution – more than obesity and alcohol combined (although air pollution tends to shorten people’s lives by a shorter time). Pollution from road traffic, particularly diesel fumes, is the most significant cause of poor air quality in most cities. The pollutants of most concern are tiny airborne particles, “PM10s”, and nitrogen dioxide. BBC News understands that the European Commission is encouraging the Supreme Court case because it would prefer to avoid a direct confrontation with the UK, which is objecting to other EU environmental rules. The timing for the government is unfortunate. This week it was forced to issue a severe pollution warning on air quality in London, with some pollution monitors registering 10/10. The government says it has tried to reduce emissions of nitrogen dioxide through tax breaks and subsidies for low emission vehicles. It has invested £75m to support green bus technologies and £560m for local sustainable transport and given around £3m in grants to local authorities every year since 2010 to help them tackle pollution on a local level. However, the government’s drive to reduce CO2 emissions blamed for changing the climate has partly contributed to the problem, by encouraging drivers to turn to diesel vehicles. The Supreme Court has heard ClientEarth’s case against the Government for failing to meet legal limits for air quality. Alan Andrews, ClientEarth lawyer, says: “The Judges were clearly convinced of the serious health implications of allowing air pollution to continue unabated. It was also apparent that the case raised a fundamental question about the rule of law. If the Supreme Court is unable to give an effective remedy to a clear and admitted breach of EU environmental law, there are grave constitutional consequences. There is now the distinct possibility that this will be referred to the European Court of Justice. The case was brought to make the Government take action to reduce air pollution, a public health issue that causes 29,000 early deaths each year – more than obesity and alcohol combined. Air pollution also stops children’s lungs from growing properly and is linked to low birth weight in newborns. • ClientEarth’s case against the Government for failing to meet legal limits for air quality will be heard by the Supreme Court on Thursday 7 March 2013. • This landmark case could lead to the Government being forced to take action to drastically reduce air pollution, a public health issue that causes 29,000 early deaths each year – more than obesity and alcohol combined. The case concerns 16 regions, (including London, Manchester and Birmingham), where government plans will fail to achieve legal limits until up to 15 years after the 2010 deadline, endangering the health of thousands. Levels of pollution on some of Britain’s busiest streets are currently double legal limits. ClientEarth, an organisation of activist environmental lawyers, originally took this case to court in December 2011, forcing the government to admit that it was breaking EU air quality laws. However, the High Court and later the Court of Appeal refused to take action, ruling that enforcement was a matter for the European commission. The appeal to the Supreme Court, which hears only cases which are “of the greatest public or constitutional importance affecting the whole population” was supported by a letter from the European commission firmly supporting ClientEarth’s interpretation of the EU air quality directive. – Obesity and alcohol are each estimated to be responsible for 9,000 premature deaths per year. See table 2.1 in this recent report. – Government lobbying to weaken air quality laws: Defra’s Red Tape Challenge Implementation Plan includes ‘Working in partnership with other Member States (MSs), use the EC review of air quality legislation to seek amendments to the Air Quality Directive which reduce the infraction risk faced by most MSs, especially in relation to nitrogen dioxide provisions’. – Pollution from road traffic, and particularly diesel fumes, is the most significant cause of poor air quality. The two pollutants of most concern are microscopic airborne particles, known as ‘PM10’, and nitrogen dioxide. – The World Health Organisation has classified diesel exhaust fumes as carcinogenic for humans, based on evidence that exposure is associated with an increased risk for lung cancer. – ClientEarth leads the Healthy Air Campaign, a coalition of health, environment and transport groups working to tackle the public health threat caused by air pollution. 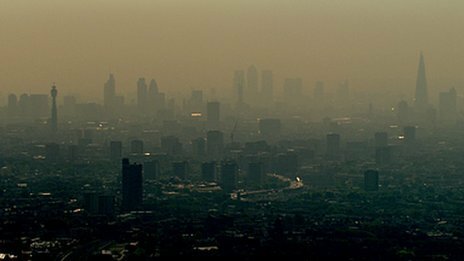 The campaign calls for a strong public voice to oppose the UK Government’s regressive stance on air quality. – 2013 has been declared the “Year of Air” by the EU, which is overhauling all its air pollution laws. The World Health Organisation is calling for stricter standards to protect health. they did not make their judgement on the case at the end of the 1-day hearing yesterday – in fact the government has till next Friday to respond to a note Client Earth’s team presented at the hearing, then i am not quite sure what happens. Posted: Wednesday, February 14th, 2007. Filed in News about Airports.